LeadDADI is a tool that allows you to receive leads directly into Operate from subscribing brokers. LeadDADI saves your sales team valuable time by taking the prospect inquiry emailed to you by any participating web broker and automatically converting it into a lead in Operate. A simple process of mapping the information provided by the broker directly into the lead fields creates an instant lead and sends an instant notification to your team telling them a new lead has been created. It also provides an accurate date/timestamp as to when the lead was received. You can keep the broker updated on the status of a lead by enabling our simple workflow rules which send automatic notifications to the broker contact at various stages of the lead’s progress, helping you to create stronger relationships with your web broker community while taking the pressure off your sales team to remember to reach out. Like all great ideas, LeadDADI is simple, but highly effective. It enables registered partners to tag HTML emails so that they are automatically imported into Operate with the business centre operator you send the enquiry to. This saves a great deal of time and discussion over lead generation sources and helps you secure your hard-earned commission. NOTE: You need to follow each step whether you are a new Operate customer, or an existing Operate customer. Go to Settings > General > Customize > Leads > LeadDADI to get started. In order to use LeadDADI you need to forward your enquiry emails to the email address displayed in Step 1 on the LeadDADI page. Ask your mail provider to setup a copy forward from your existing enquiry email address, to the email address listed here. All leads will then be automatically processed by LeadDADI. You will still receive the original email. Our servers receive the copy, map the data, create a lead and then delete our copy. The lead will automatically generate every 10 minutes when a user is not logged onto the leads section. When a user accesses the Sales > Leads this will then generate the lead within Operate. Setup auto assignments so that your leads are assigned automatically to the best person to deal with the enquiry. Click here to see how. Check the box to Enable LeadDADI and then click on "Save". Your LeadDADI is now live! Send a test lead to your enquiry email address, the enquiry will show in the Leads module in Operate as a New Unreadable Lead. Email the brokers that you get enquiries from and let them know that you can now accept leads in the LeadDADI format. Brokers can then send you leads with a formatted LeadDADI attachment which will automatically populate your leads with the enquiry information. NOTE: If you want to disable LeadDADI in the future you can uncheck this box at any time. NOTE: If you are already using leadDADI in Operate then enabling this will replace your current leadDADI Processor. In order to be correctly received within Operate, a LeadDADI lead needs to contain the correctly formatted XML attachment from the broker. which includes the broker's LeadDADI ID and is named "leaddadi.xml". This attachment is provded by essensys upon activating LeadDADI on your account. When a broker receives a Lead on your behalf, they will send it to the email address you have provided. The messages coming to this email are forwarded to Operate, as shown in Step 1. There can be one or several email addresses which forward their incoming emails to the address listed within your Operate account. Once a valid lead email is received, Operate will create a record under Sales > Leads, containg all of your broker information, the details included within the .xml attachment, as well as the original email received via the broker, to your original email address (before forwarding to Operate). This helps you retrieve any details which may have been included within the email but not in the xml file. You can edit LeadDADI records themselves, as well as the general Lead layout. 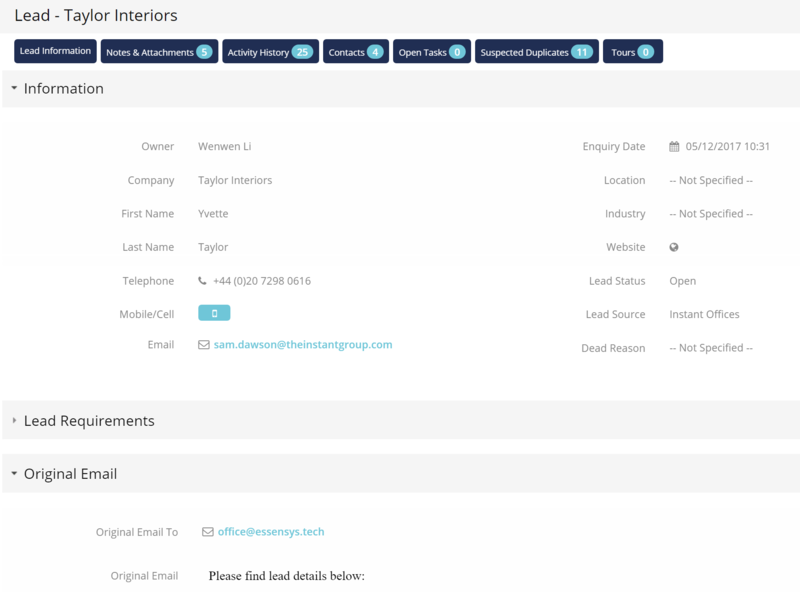 LeadDADI records can include a field called "Original Email To" which can be added via the leads page layout and which shows where the original email has been received. This shows you the exact source of the lead, before it has been forwarded to Operate. This field accepts multiple email addresses. You can add it right next to the Original Email area or anywhere else on the layout.